Still have lots of summer blooms to show and also noticing early autumn changes in some of the gardens I frequent. 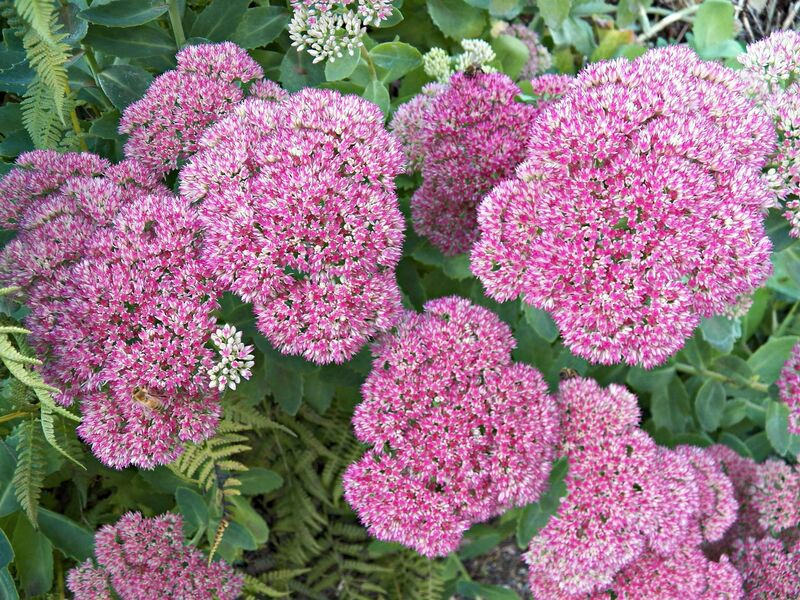 I’m now noticing this Stonecrop species that is a nice, rosy pink color right now. Later in the season, its color will deepen. 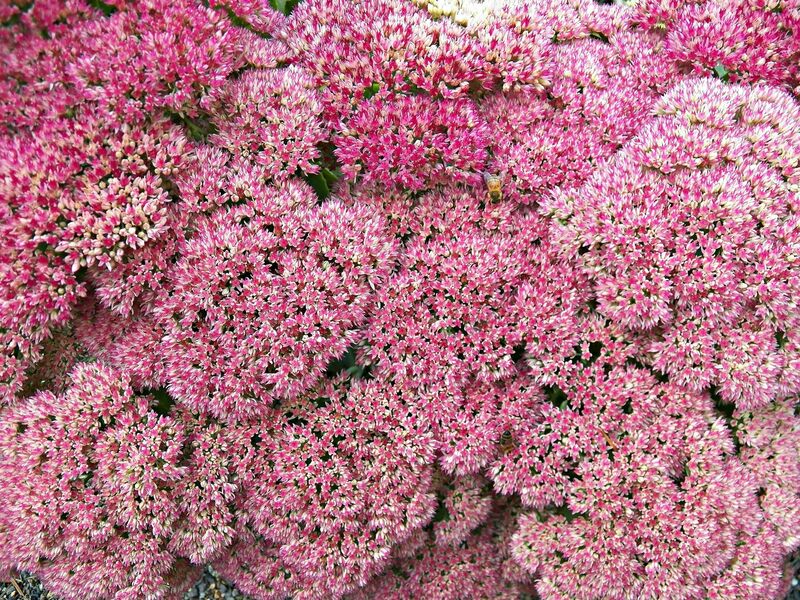 Blooms close together form a spectacular carpet of pink! Here’s an interesting plant that exhibits its fruit in late summer. 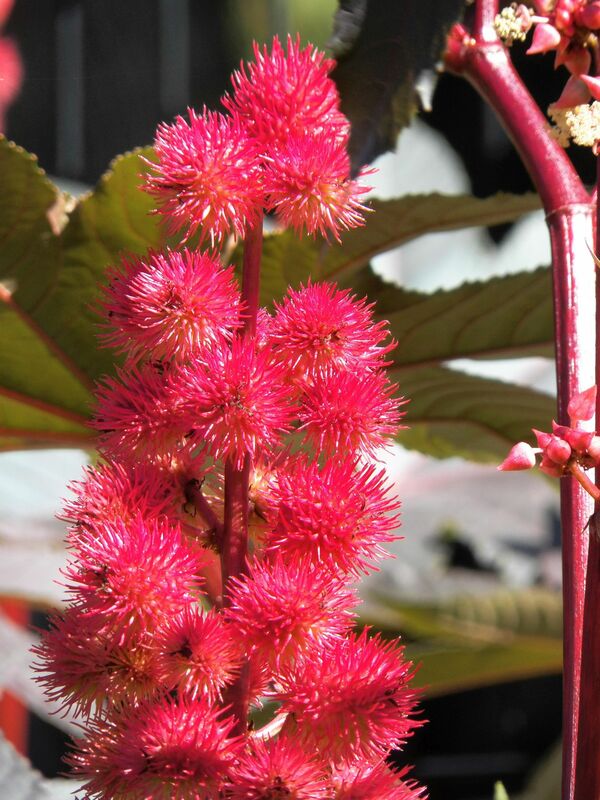 It is the Castor Bean Plant. It grows tall and has huge, purple leaves and red, spikey fruits that contain poisonous seeds. 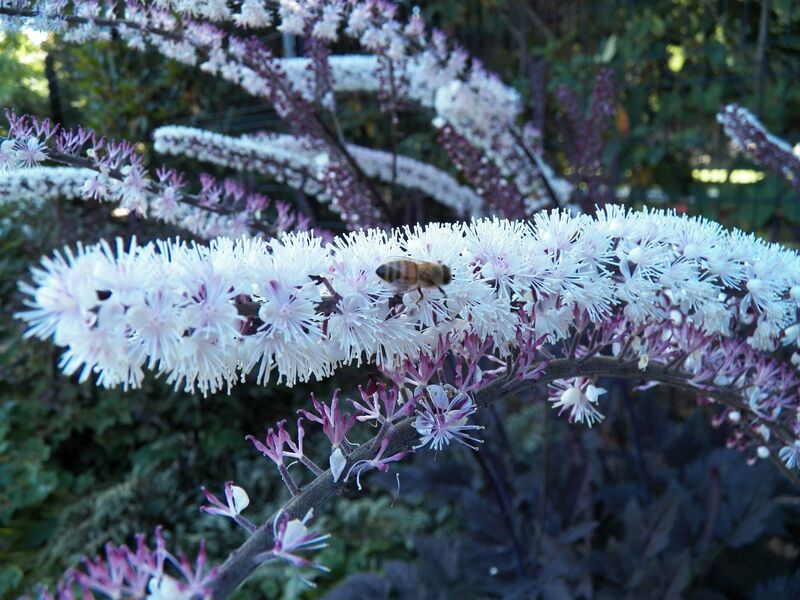 Here’s an interesting plant called Purple Leaf Bugbane. It grows really tall and has purple leaves at its base. 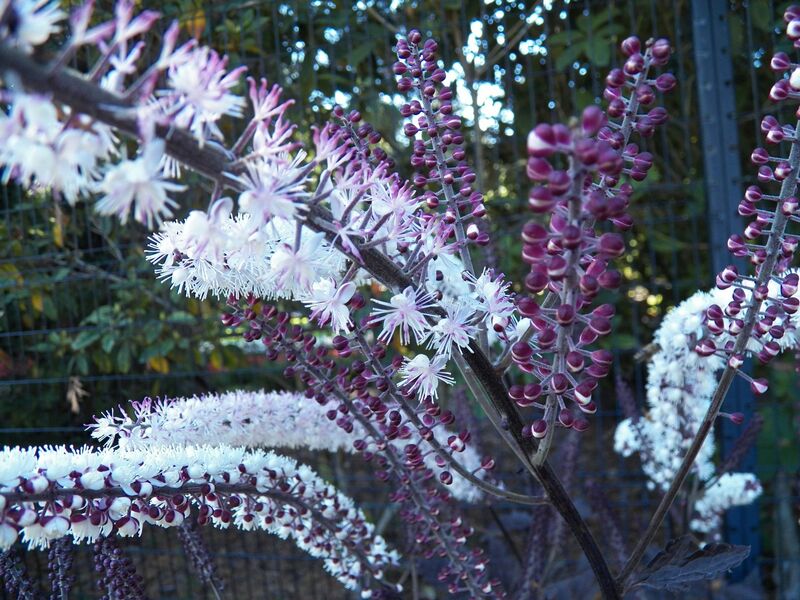 The long, fuzzy plumes have a lot of fragrance and attract bees. 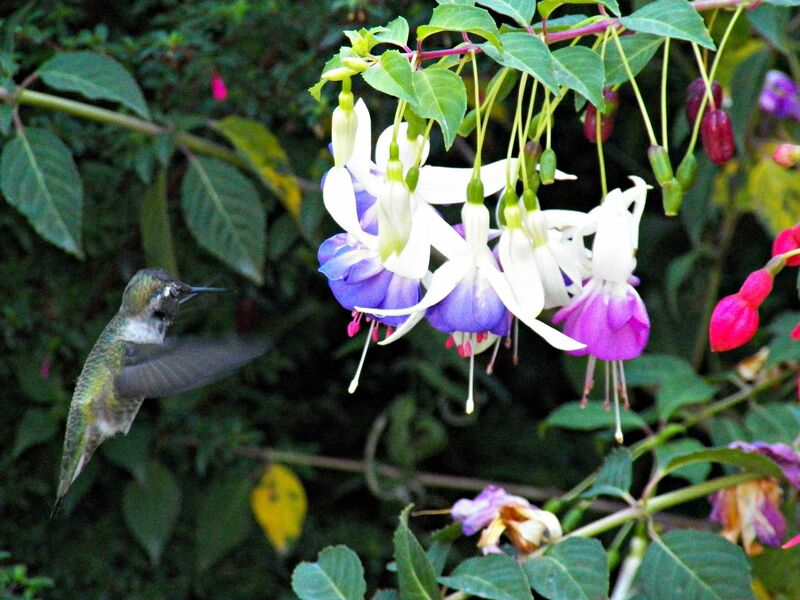 I spotted this little Hummingbird among the Fuchsias and tried to get off some shots, which is really hard to do with these fast moving guys! 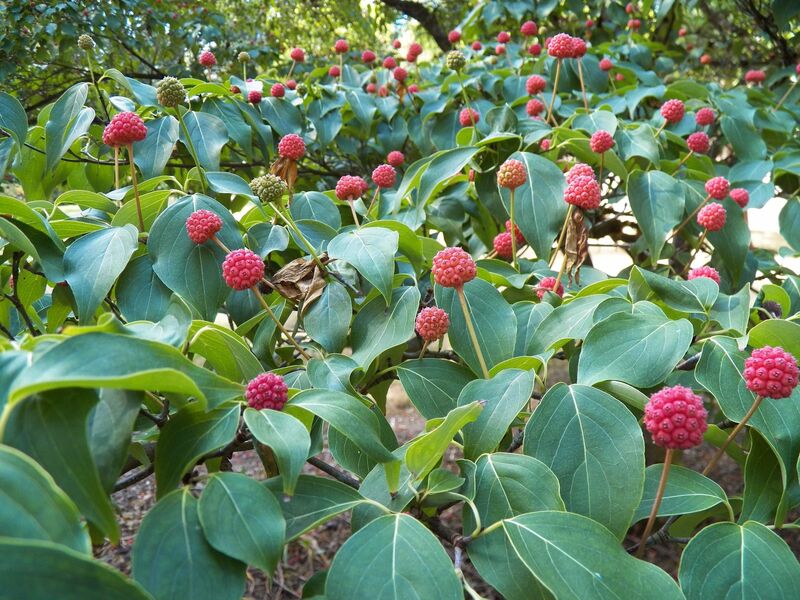 I was pleasantly surprised to find this Kousa Dogwood full of red berries. They are edible from this particular Dogwood species. Not all Dogwood berries are edible. Another pleasant surprise I found! 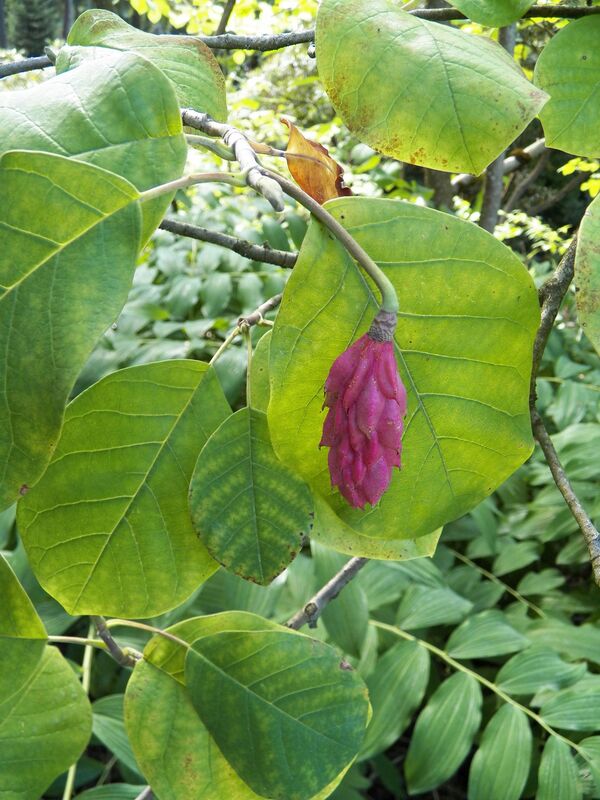 Here is a pink fruit hanging from a Oyama Magnolia tree. Later in the season, the fruit will open up to reveal the seeds inside. Another site this time of year are the bright, orange-red berries of the Mountain Ash. 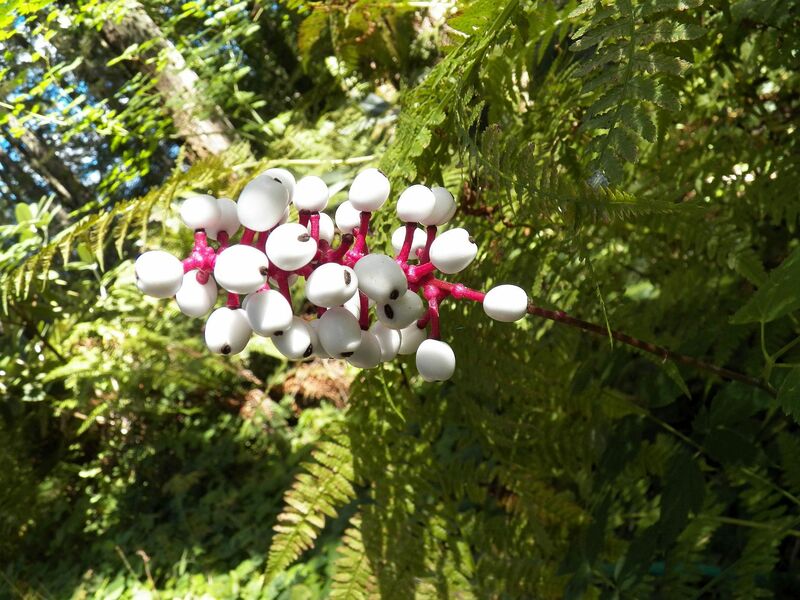 Here’s something that I have not seen before: White Baneberry, sometimes called Doll’s Eyes. A poisonous plant! I think it quite pretty with its pink stem and white berries with black pupils, hence the name Doll’s Eyes. And lastly, I couldn’t help but notice the contrasting colors in this setting. One can see how autumn is definitely starting to set in! 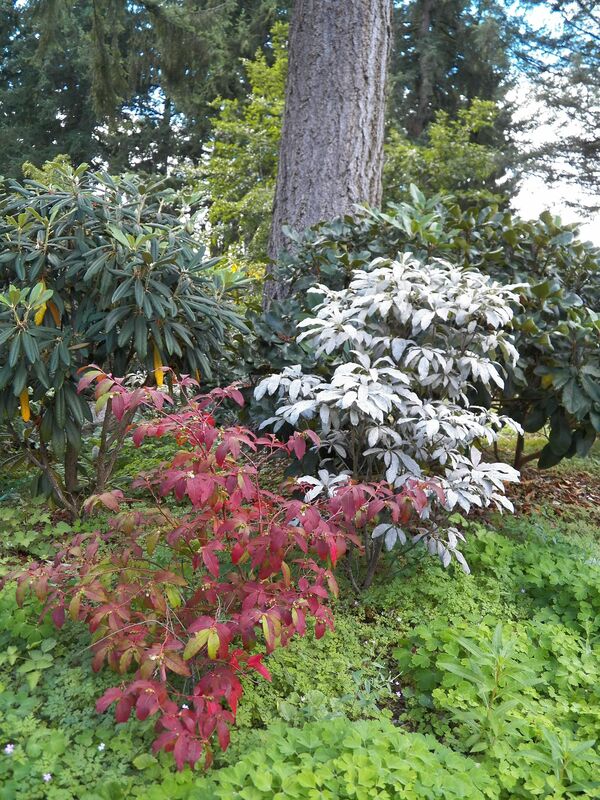 This entry was posted in Nature, Photography and tagged autumn, Bugbane, castor bean plant, Dogwood, floral photography, flowers, hummingbird, Magnolias, Mountain Ash, nature photography, seasons, Sedum, stonecrop. Bookmark the permalink. Thanks, so much! Glad you enjoy the photos! I seem to find something new and learn something new every time I go out to explore nature! Is mountain ash native? I got two small seedlings from the Arbor Day Foundation two years ago for a garden parcel. However, I have been unable to get back there to know if they even survived. I have never seen them here. 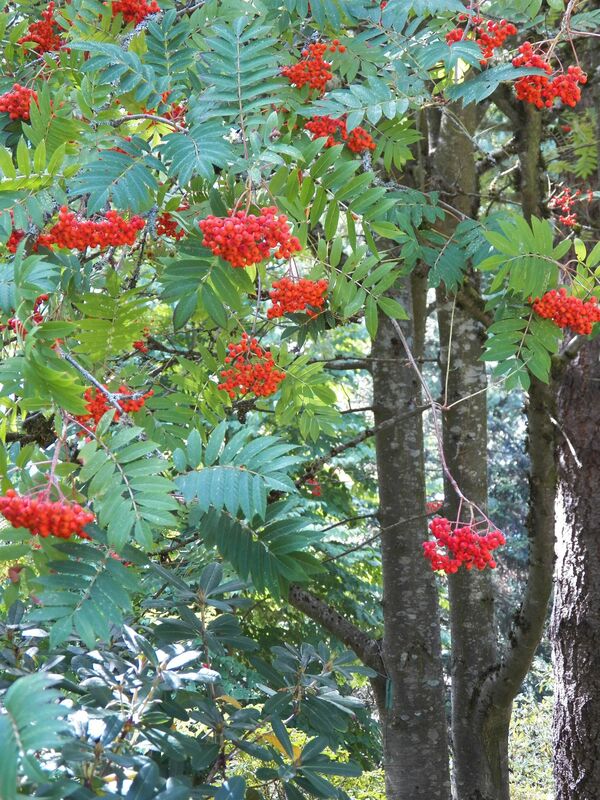 From what I have read, the Mountain Ash is native to cool, temperate regions throughout the northern hemisphere. Yes, there is even a species that is native to the north of here. However, I have never seen one. Nor have I ever noticed them while in the Northwest. Mine are from Eastern North America. We saw a lot of mountain ash up in Mount Rainier NP. They’re pretty hard to miss with those bright red berries this time of year. Oh, yes! They are all over here and so pretty now. I didn’t know that you went to Mt Rainier, as well. I’m only 55 miles from the park. What?! I do not remember seeing any. I was not looking for them of course. I will need to be more observant. I do not got to Mount Rainier, but I will eventually get back to the Olympic Peninsula. A few of the same specie are endemic there. This time of year the bright scarlet red berries of the mountain ash are hard to miss. I’m not sure I could pick the tree out in other seasons. I’m not sure, but mountain ash is mostly found at higher altitudes than what you’d find along the coast. The name pretty much implies that. Oh, of course. That is why I do not see those in Northern California. When I am on the Olympic Peninsula, I am near the coast, which is of course at lower elevations.